Notes: Drs. John Beale Davidge, Nathaniel Potter and John Crawford begin practice in Baltimore. Notes: ANDERSON, Henry, Balto. merchant, and Miss Crawford, dau. of Dr. Crawford of Hanover St., were married yesterday by Dr. Allison. (BTD, 24 Oct. 1799). Notes: During the summer of this year Dr. John Crawford introduces vaccination into Baltimore, the virus being obtained from Mr. Ring, London. This was contemporary with its use by Dr. Benjamin Waterhouse, of Cambridge, Mass., July 8 (see “Ring on Cowpox,” 1801, p. 459). The supply of Crawford and Waterhouse was exhausted and Waterhouse’s second supply arrived in 1801, simultaneously with a supply for Dr. James Smith, of Baltimore. 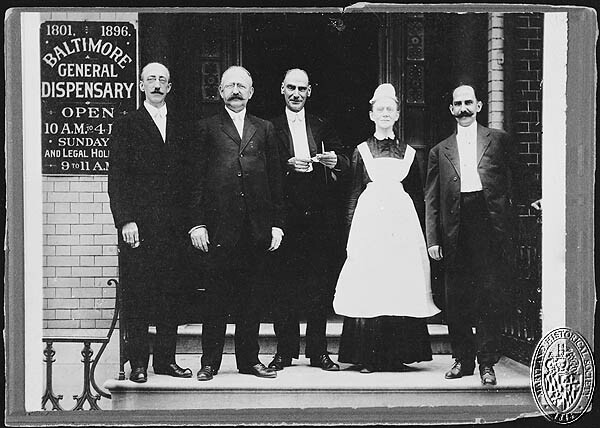 Notes: Baltimore General Dispensary founded, chiefly through the efforts of Dr. John Crawford; 234 patients treated the first year (January 9). Notes: CRAWFORD, Thomas S., son of Dr. Crawford of Balto., died at Montpelier, France on 11 May, while studying medicine at the university there. (Baltimore Federal Gazette, 9 Aug. 1803). Notes: Penitentiary erected on Madison Street, near the York Road, largely through the efforts of Dr. John Crawford. Notes: The Medical and Chirurgical Faculty meets at Baltimore; Drs. Crawford and Davidge deliver orations; vaccination again endorsed; licenses to be granted to oculists when competent. Notes: Dr. John Crawford reports a striking proof of the contagious nature of phthisis pulmonalis in a man and wife (Report of Censors of Baltimore, MS. Archives). — Dr. Crawford also notes relief in pertussis by vaccination. Notes: Review of “a lecture introductory to a course of lectures on the cause, seat and cure of diseases, proposed to be delivered in the city of Baltimore, by John Crawford, M.D.” — 1811. Notes: Dr. John Crawford lectures on Natural History in Commerce Street. Notes: CRAWFORD, Dr. John M.D., Right Worshipful Grand Master of the Masons of Md., died yesterday in his 68th year. (Baltimore Federal Gazette, 10 May 1813). Notes: Deaths: Drs. C.A. Warfield, in Anne Arundel County, January 29, aet. 61; John Crawford, at Baltimore, May 9, aet. 67; S.T. Johnson, at Easton, July 16; P.E. Noel, at Centerville, October 14, set. 45; James Cocke, at Baltimore, October 25. Crawford, John, A lecture, introductory to a course of lectures on the cause, seat and cure of diseases. Proposed to be delivered in the city of Baltimore� Baltimore: Published by Edward J. Coale; Benjamin Edes, printer. 51 p. 20 cm. Delivered at the College of Medicine of Maryland. Errata slip mounted on verso of title page.